Google has a solution for almost everything. Name any technology and Google has come up with a solution for it or is cracking up some solution in their labs. 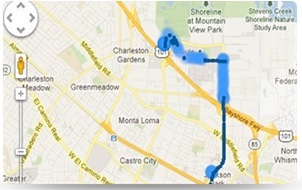 Google Coordinate is Google’s answer for mobile work force management. It is a simple technology that needs a few smartphones, an admin controller and obviously net connectivity which helps to monitor the entire workforce, schedule or reschedule assignments to workers, get their locations, etc. How does this Google Coordinate work? 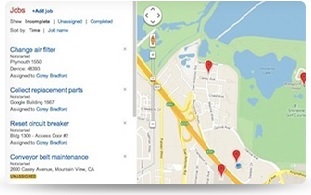 Google Maps Coordinate is a web and mobile application that helps organizations manage their mobile workforce. The Maps Coordinate API exposes job creation, listing, and update functionality through a web service. Before using the Maps Coordinate API, you must have created a team at https://coordinate.google.com, with users assigned to the Admin and/or Dispatcher role. Admins can retrieve job lists; Dispatchers can create and update jobs through the API. You then register your organisation’s workforce into the team account. The team members then have to log in into their respective accounts on their smartphones (Android and iPhone) and the Admins and/or Dispatchers can log in into either their phones or a desktop. The Admin/ Dispatchers can view the location of each registered team member on a map from the device they are logged into. On the basis of the demands of a particular job, he/she can assign the task to the nearest available team member. They can also co-ordinate with the other team members and dispatch help based on the requirements of a particular task. All team members can be seen on a Google Map. By assigning jobs to the nearest worker, more tasks can be completed in a shorter amount of time and workers are color-coded so its obvious who is available. 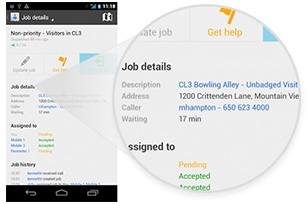 Administrators can dispatch jobs with the confidence that an individual’s location is correct, even if they are indoors since Google Maps Coordinate integrates Google Indoor Maps. Workers can see a list of their jobs, and check in to show that they have started. This reduces miscommunication between the worker and dispatcher. Workers are able to minimize down time between tasks and complete a higher number of jobs per day. Using their mobile device, workers can view detailed information about the job, as well as add their own notes which are immediately stored in the cloud. This eliminates paper-based workflows, duplication of work and saves teams from losing information. A custom location enables you to name locations on a map such as customer sites, the location of facilities, or areas to avoid. It enables the dispatcher to pinpoint the exact location of the job and saves time when the location is used again since the name is saved and auto completes. The location history of each worker can be shown, which helps to make more informed decisions about how teams operate and improve the efficiency of the mobile workforce. Do more workers need to be hired? Is there a better location for the team? Google Coordinate provides a realtime solution for workforce management and is customisable to suit the needs of the organisation as the API platform facilitates to customise the Coordinate with their existing workforce management system. It provides a scalable result with real-time visibility of work force at any given time and does not require the installation of any special hardware.